This Kolam is called "Aishwarya Kolam". 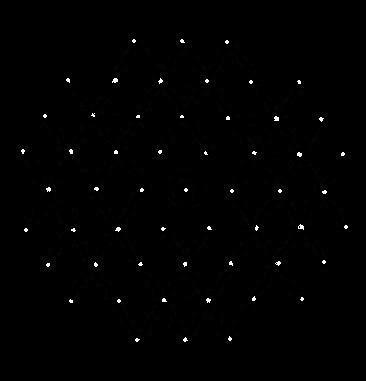 8 - 3 interlaced dots (Idukku Pulli) Kolam - Start with 8 dots in the center, next 7 interlaced dots and again 8 interlaced dots. 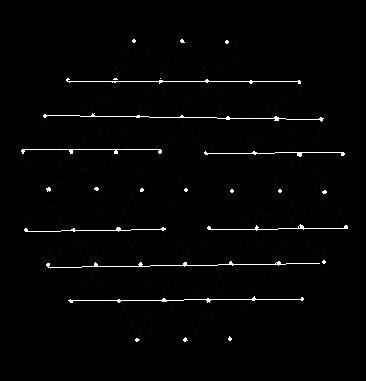 Then - put interlaced dots at both ends and stop at 3 as shown above. Join dots as shown above. Finish the Kolam by joining the remaining dots as above. This is the Aishwarya Kolam. Keeping this Kolam in the center, we can draw more small loops or curves or a big circle around the Kolam. We can draw this kolam with wet rice flour paste. We can also fill with colour powders. Check here for more details on Aishwarya Kolam. Thank you so much.It is very beautiful and auspicious.I am going to make it for varalakshmi. Thank you for visiting my site. Glad to know you are going to draw this kolam for varalakshi puja. All the best and God bless you. what is the significance of aishwarya kolam? Some designs like lotus, star etc are denoting God / Goddess and these types of kolams are drawn before God and Puja rooms. "aishwarya kolam" is drawn in the puja room with a belief that it will bring wealth to the family. There are more puja kolams called Hirudaya kamalam, navagragha kolam etc. This kolam looks very beautiful. I used to drawn your kolams on fridays in pooja room. even my mother and mother in law are learning pooja room kolams from me. Welcome to my site. Nice to hear your family is trying the Kolams. I will try to post some kolams for Vinayaka chaturti. thanks, for these. I am an ameircan married to a Tamilian with pretty traditional Brahman parents. I make these when I have them or other relatives come over. They really like them! Welcome to my site. Nice to hear, being an american, you like to learn this art to keep up your husband's family tradition. Drawing kolam is very interesting and I wish you all the best. Thank you for visiting my site. Nice to hear that you tried this kolam. i saw your kolams they are very beautiful. Please keep drawing varieties for the benefits of all ladies. Let the younger generation start doing it in their courtyards for their benefit. Thank you for visiting my site. The purpose of this site is, spread this art to the younger generation and to keep this art alive. your website is awesome and the contents I just love it.I have tried most of ur receipies and it turned out really good.Your kolams are beautiful and I am using them for Pujas.It is just great.. Thank you for your encouraging comments. hi, iam thenmozhiravi very fentastic this kolam the method see very easy. Thank you for visiting my site and your comments. Thank you so much the way u teach drawing kolam life becomes so easy. My 4yrs daughter Shreya says the kolam is excellent and the colour combination tooo good . Thank you for visiting my site and your comments. I am very glad to note that your four years daughter like this kolam. The very purpose of this site is to take this art to our younger generation. It is better to avoid putting Puja kolams on the street, because people may step on the kolam. If it is inside the compound wall or where people will not walk on the place, we can put it. My grand mother used to draw a small kolam in puja room and says it is kamakshi amman padham(foot print).But kolam doesn't look like footprint.but some form of kamalam.but it is not hridhaya kamalam.i tried to recollect many times but i couldnt.Can you plz post a kamakshi amman footprint??? I will find out and post it soon. oneday when i was searching for some differnet & easy kolams luckily and fortunately i got this site..your kolam and the way u took effort to make the visitos to learn the kolam easily makes me feel that my mother is sitting behind me and making me to do...Now I am very interested and i am trying to put complecated kolams and i am not repeating the same kolam very often..everyone in my home were very happy about my kolam.. The way u teach the kolam to draw is very nice.I wanted to learn the Aishwarya kolam since so many years.I read about ur site in Mangaiyarmalar.Since I am staying in a flat ,I learned so many small kolams with Aishwarya kolam. Kolam plays significant part in 'Brahman community'. In our house , during 'Vilakku pujai' the Sastrigal used to draw 'Shri Chakram' kolam, upon which Shri Devi is invoked in Villakku. Normaly, ladies of those days in Brahmin community donot draw 'pulli vaitha kolam' On Tuesdays and Fridays my mother used to draw 'Kanya kolam' (straight lines crossing each other and having lotus flower drawing in the four corners), Tamarai poo kolam and 'Homa (or Oma ) Thaazi'. Homa taazi is simple two triangles crossing each other. Probably this is drawn for performing 'homam'. Though we heartily appreciate the beauty of the dotted kolams, if anybody clarifies about the straight line kolams, we can know the significance behind them. thank you so much the way you teach drawing kolam. your kolams are really superb. i have kept a note book for drawing kolams. mam could u please post deer kolam. Thanks a lot. The kolams are really superb. 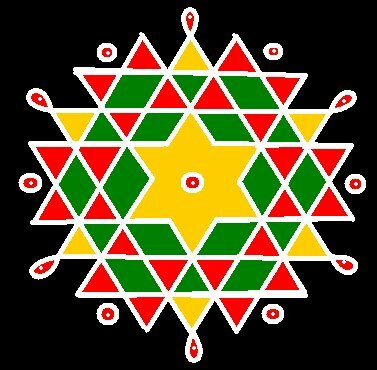 How do you draw the kolams on computer? Is there any special software that you use? I want to draw them on my computer. Traditionally,in my family no one draws Kolam.But,i became interested in drawing kolams as a teenager and learnt few designs,from my Tam-brahm friend:)One of my faves was this 'Aishwarya kolam'.But,once i went to hostel for my studies and later got married and was busy with kids,i forgot most of the designs. Recently I visited your website while I was browsing for something. I really liked your kolams. Amazing work. How do u make kolams on computers. I always scan my kolams on to the computer to save it as JPEG files. How do u do the kolams on computer itself. If u don't mind telling me how u do it on compter itslef I will be very happy and I can send all my kolams to u.
Kalpana - my correct e-mail id: kamalarsn@gmail.com (which is wrongly mentioned in my previous reply). Thank you for sharing the information with me. I will try to do it and let you know. I will send my collections of kolams to your email soon. Your collection is awesome and your selfless interest and effort in sharing to all is immensely appreciated. ..
Hello, I have put this kolam in front of the golu in my home.Your instructions are so clear I had no problems in following them.The kolam has turned out really nice.I have coloured it with Tumeric powder, Kumkum powder and Moong Dal powder.An organic Aishwarya kolam!!!! Hello, my daughter is 11 years old. She is very much interested in drawing kolams and just started learning it. Can you post some simple and easy kolams for children and beginners?